We have great news to share! 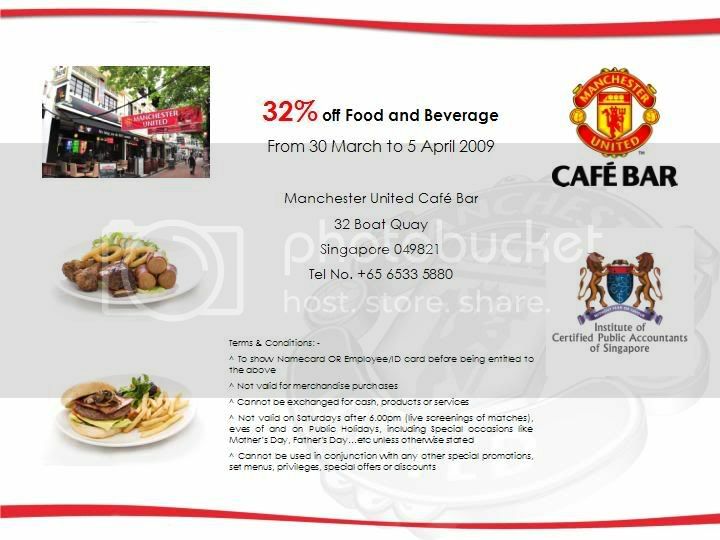 Starting this Evening, 19 March 2009 and every Thursday onwards, we are having a Manchester United FANS NIGHT at Machester United Cafe Bar at 32 Boat Quay! There are many exciting plans in store for the FANS NIGHT...just for you, the FANS. NETT spent in one single receipt. 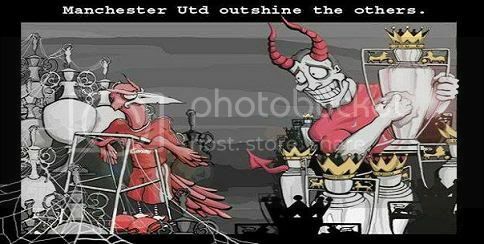 - TICKETS TO OLD TRAFFORD! Every S$30 you spend will stand you a chance to win a pair of game tickets to watch Manchester United match at Old Trafford on 9 May 2009! AND a very SPECIAL APPEARANCE of the Manchester United Soccer School Coaches! Here is a chance to mingle with the coaches and take a photo or two with them! Cafe Bar this evening for a rousing start to the FANS Night! For Reservations, please call +65 6533 5880.
how to know if you are United fan? don the red jersey? just say you are there for the Man Utd fans night. if you wanna wear the red jersey, also can lah! swee man! aiyah they give discount for alcohol, which i don't drink... the discounts apply for other beverages? And we're going to WEMBLEY!!! (03-19-2009, 03:09 PM)lpjz290 Wrote: swee man! aiyah they give discount for alcohol, which i don't drink... the discounts apply for other beverages? oh yeah hor... haha! ok gan bei to that! From Glory to Glory... 19 to 20! Rooney's Die Hard Fan ! I just found another reason to go there. Current time: 04-24-2019, 10:17 PM Powered By MyBB, © 2002-2019 MyBB Group.